Taylor Ledwein, New Prague, Minn., pitches to the 9th green during U.S.Women's Open Sectional Qualifying May 14 at Stillwater Country Club, Stillwater, Minn. Photos by W.P. Ryan. Joanna Kim, Edina, Minn., pitches to the 18th green during U.S.Women's Open Sectional Qualifying May 14 at Stillwater Country Club, Stillwater, Minn. Photos by W.P. Ryan. Joanna Kim, Edina, Minn., reviews her options at the 18th green during U.S.Women's Open Sectional Qualifying May 14 at Stillwater Country Club, Stillwater, Minn. Photos by W.P. Ryan. Sydney Bormann, Parkston, S.D., holes out at the 1st green during U.S.Women's Open Sectional Qualifying May 14 at Stillwater Country Club, Stillwater, Minn. Photos by W.P. Ryan. Janice Kim, Edina, Minn., holes out at the 1st green during U.S.Women's Open Sectional Qualifying May 14 at Stillwater Country Club, Stillwater, Minn. Photos by W.P. Ryan. Casey Danielson, Osceola, Wis., rolls a putt at the 1st green during U.S.Women's Open Sectional Qualifying May 14 at Stillwater Country Club, Stillwater, Minn. Danielson was medalist with 73-68--141 (-3). Photos by W.P. Ryan. Janice Kim, Edina, Minn., follows her putt at the 1st green during U.S.Women's Open Sectional Qualifying May 14 at Stillwater Country Club, Stillwater, Minn. Photos by W.P. Ryan. Madelyn Hawkins, Asbury, Iowa, at the 1st green during U.S.Women's Open Sectional Qualifying May 14 at Stillwater Country Club, Stillwater, Minn. Photos by W.P. Ryan. Celia Barquin Arozamena, Spain, follows her putt at the 1st green during U.S.Women's Open Sectional Qualifying May 14 at Stillwater Country Club, Stillwater, Minn. Arozamena, who posted 78-66--144 (E), claimed the 2nd spot after birdieing the 1st playoff hole. Photos by W.P. Ryan. Casey Danielson, Osceola, Wis., and Rob Tennant, MGA official, at the 10th tee during U.S.Women's Open Sectional Qualifying May 14 at Stillwater Country Club, Stillwater, Minn. Danielson was medalist with 73-68--141 (-3). Photos by W.P. Ryan. Casey Danielson, Osceola, Wis., posted scores of 73-68--141 (-3) to earn medalist honors May 14 during U.S. Women's Open Sectional Qualifying at Stillwater Country Club, Stillwater, Minn. Photo courtesy of Nick Hunter/MGA. Grace Kellar, Edina, Minn., reacts to a missed putt at the 18th during U.S.Women's Open Sectional Qualifying May 14 at Stillwater Country Club, Stillwater, Minn. Kellar claimed the 2nd alternate spot with 72-73--145. Photos by W.P. Ryan. Grace Kellar, Edina, Minn.,from the greenside bunker at 18 during U.S.Women's Open Sectional Qualifying May 14 at Stillwater Country Club, Stillwater, Minn. Kellar claimed the 2nd alternate spot with 72-73--145. Photos by W.P. Ryan. Alexandra Harkins, Crystal Lake, Ill., chips to the 9th green during U.S.Women's Open Sectional Qualifying May 14 at Stillwater Country Club, Stillwater, Minn. Photos by W.P. Ryan. Taylor McCorkle, Oregon, Wis., at the 7th tee during U.S.Women's Open Sectional Qualifying May 14 at Stillwater Country Club, Stillwater, Minn. Photos by W.P. Ryan. Ida A.I.M. Putri, Bali, Indonesia, follows her putt at the 1st green during U.S.Women's Open Sectional Qualifying May 14 at Stillwater Country Club, Stillwater, Minn. Photos by W.P. Ryan. Stephanie Herzog, Red Wing, Minn., pitches to the 1st green during U.S.Women's Open Sectional Qualifying May 14 at Stillwater Country Club, Stillwater, Minn. Photos by W.P. Ryan. Emma Albrecht, Ormond Beach, Fla., putts at the 1st green during U.S.Women's Open Sectional Qualifying May 14 at Stillwater Country Club, Stillwater, Minn. Albrecht, who posted 74-70--144 (E), is 1st alternate after losing in a playoff. Photos by W.P. Ryan. Alexandra Swayne, Maineville, Ohio, reacts to her approach at the 1st green during U.S.Women's Open Sectional Qualifying May 14 at Stillwater Country Club, Stillwater, Minn. Photos by W.P. Ryan. Alexandra Swayne, Maineville, Ohio, chips to the 1st green during U.S.Women's Open Sectional Qualifying May 14 at Stillwater Country Club, Stillwater, Minn. Photos by W.P. Ryan. Carolyn Barnett-Howe, Appleton, Wis., follows her drive at the 7th tee during U.S.Women's Open Sectional Qualifying May 14 at Stillwater Country Club, Stillwater, Minn. Photos by W.P. Ryan. Mia Seeman, Milton, Wis., at the 7th tee during U.S.Women's Open Sectional Qualifying May 14 at Stillwater Country Club, Stillwater, Minn. Photos by W.P. Ryan. Christine Portillo, Eden Prairie, Minn., at the 7th tee during U.S.Women's Open Sectional Qualifying May 14 at Stillwater Country Club, Stillwater, Minn. Photos by W.P. Ryan. Taylor Ledwein, New Prague, Minn., putts at the 1st green during U.S.Women's Open Sectional Qualifying May 14 at Stillwater Country Club, Stillwater, Minn. Photos by W.P. Ryan. Alexandra Harkins, Crystal Lake, Ill., putts at the 1st green during U.S.Women's Open Sectional Qualifying May 14 at Stillwater Country Club, Stillwater, Minn. Photos by W.P. Ryan. Jessica Reinecke, Verona, Wis., at the 7th tee during U.S.Women's Open Sectional Qualifying May 14 at Stillwater Country Club, Stillwater, Minn. Photos by W.P. Ryan. Kenzie Neisen, New Prague, Minn., drives at the 7th tee during U.S.Women's Open Sectional Qualifying May 14 at Stillwater Country Club, Stillwater, Minn. Photos by W.P. Ryan. Shawn Rennegarbe, Addieville, Ill., drives at the 7th tee during U.S.Women's Open Sectional Qualifying May 14 at Stillwater Country Club, Stillwater, Minn. Photos by W.P. Ryan. Andriel Aimua, St. Paul, Minn., at the 7th tee during U.S.Women's Open Sectional Qualifying May 14 at Stillwater Country Club, Stillwater, Minn. Photos by W.P. Ryan. Sarah Burnham, Maple Grove, Minn., drives at the 7th tee during U.S.Women's Open Sectional Qualifying May 14 at Stillwater Country Club, Stillwater, Minn. Photos by W.P. Ryan. Lauren Guiao, Newburgh, Ind., chips to the 1st green during U.S.Women's Open Sectional Qualifying May 14 at Stillwater Country Club, Stillwater, Minn. Photos by W.P. Ryan. Jaclyn Lee, Calgary, Alta., at the 7th tee during U.S.Women's Open Sectional Qualifying May 14 at Stillwater Country Club, Stillwater, Minn. Photos by W.P. Ryan. Olivia Schmidt, Edmond, Okla., at the 18th tee during U.S.Women's Open Sectional Qualifying May 14 at Stillwater Country Club, Stillwater, Minn. Photos by W.P. Ryan. Gabrielle Curtis, Eau Claire, Wis., drives at the 18th tee during U.S.Women's Open Sectional Qualifying May 14 at Stillwater Country Club, Stillwater, Minn. Photos by W.P. Ryan. Grace Kellar, Edina, Minn., putts at the 6th during U.S.Women's Open Sectional Qualifying May 14 at Stillwater Country Club, Stillwater, Minn. Kellar claimed the 2nd alternate spot with 72-73--145. Photos by W.P. Ryan. Selanee Henderson, De Pere, Wis., at the 6th green during U.S.Women's Open Sectional Qualifying May 14 at Stillwater Country Club, Stillwater, Minn. Photos by W.P. Ryan. Laurel Gill, San Diego, Calif., at the 18th tee during U.S.Women's Open Sectional Qualifying May 14 at Stillwater Country Club, Stillwater, Minn. Photos by W.P. Ryan. Alexis Thomas, Middleton, Wis., at the 18th tee during U.S.Women's Open Sectional Qualifying May 14 at Stillwater Country Club, Stillwater, Minn. Photos by W.P. Ryan. Alexis Miestowski, Schererville, Ind., at the 18th tee during U.S.Women's Open Sectional Qualifying May 14 at Stillwater Country Club, Stillwater, Minn. Photos by W.P. Ryan. Joanna Kim, Edina, Minn., at the 7th tee during U.S.Women's Open Sectional Qualifying May 14 at Stillwater Country Club, Stillwater, Minn. Photos by W.P. Ryan. Claire Cameron, Martinsville, Ind., at the 7th tee during U.S.Women's Open Sectional Qualifying May 14 at Stillwater Country Club, Stillwater, Minn. Photos by W.P. Ryan. Natalie Roth, Lake Park, Minn., at the 7th tee during U.S.Women's Open Sectional Qualifying May 14 at Stillwater Country Club, Stillwater, Minn. Photos by W.P. Ryan. Marta Martin, Madrid, Spain, at the 7th tee during U.S.Women's Open Sectional Qualifying May 14 at Stillwater Country Club, Stillwater, Minn. Photos by W.P. Ryan. Erica Oberding, Des Moines, Iowa, at the 7th tee during U.S.Women's Open Sectional Qualifying May 14 at Stillwater Country Club, Stillwater, Minn. Photos by W.P. Ryan. Casey Danielson, Osceola, Wis., drives at the 10th tee during U.S.Women's Open Sectional Qualifying May 14 at Stillwater Country Club, Stillwater, Minn. Danielson was medalist with 73-68--141 (-3). Photos by W.P. Ryan. STILLWATER, Minn. – Although she grew up on golf courses in neighboring Wisconsin and played collegiate golf at Stanford University, Casey Danielson seems to enjoy the comforts, and successes, of playing in Minnesota. In 2016 Danielson posted a round of even par 72 at Forest Hills Golf Club to earn a spot in her seventh consecutive U.S. Women’s Amateur Championship. A year ago, during her first event as a professional, Danielson carded a 2-under par 142 at the Legends Club to qualify for her first U.S. Women’s Open. 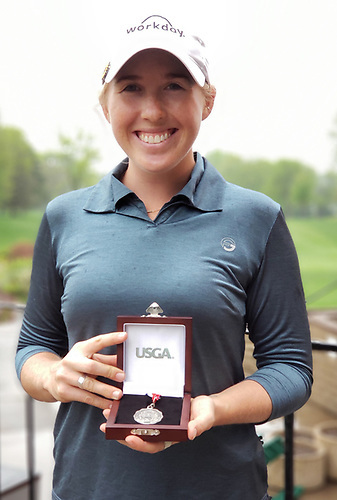 The trend continued Monday at Stillwater Country Club as Danielson fired rounds of 73 and 68, respectively, to earn her second straight trip to the U.S. Women’s Open by claiming medalist honors at 3-under par 141. A native of Osceola, Wis., Danielson played the front nine of Monday’s morning round at 1-over par before trading a birdie with a bogey over the final nine to post an early round of 73. Danielson rolled in a 25-footer for birdie on the second hole during Monday’s afternoon round before tapping in a short birdie birdie at the seventh to move into red figures. Blasting a 7-iron to 15 feet at the par-4 ninth, Danielson converted her birdie chance to turn at 3-under for the round. “I was playing really solid, so if the putts fall, they fall, and if not, just keep it steady and that’s all you can do,” Danielson said. “Then I birdied ten and then it started raining. The mindset changes a little bit—you’ve got a lot more to worry about and there are some tough holes out there that get a little longer. In December Danielson earned her status on the Ladies European Tour by winning Lalla Aicha Tour School in Morocco to claim her card for the 2018 season. Playing in four co-sanctioned events in Australia, Danielson notched three top-15 finishes, including runner-up at the Women’s NSW Open, climbing to 14th on the LET Order of Merit and launched her as a front-runner for Rookie of the Year honors. Danielson said her goal is to ultimately play professionally in the United States, but she’s enjoying her time playing across the globe. She will compete in a Symetra Tour event in Michigan shortly after the U.S. Women’s Open before competing in the Ladies Scottish Open in July. At the national championship at Trump National Golf Club in Bedminster, N.J., last July, Danielson carded an opening-round 76 before coming back with a round of 73, but would miss the weekend cut by three strokes. After shooting a gloomy round of 78 to begin the qualifier Monday, the only thing 21-year-old Spaniard Celia Barquin Arozamena thought to do was call her mother. Arozamena didn’t quite match her career-best round of 65, but she did set a new course record at Stillwater Country Club by firing a 6-under par 66 to finish in a tie for second with Emma Albrecht at even par 144 before carding a birdie on the first playoff hole to claim the final qualifying spot for the national championship later this month. “I went out there super relaxed. I didn’t think I was going anywhere so I had fun and I played amazing,” she said. Arozamena got started by sticking her approach inside of three feet at the second before rolling in a 20-footer for birdie at the par-5 fifth. Gaining momentum with her putter on the front nine despite a bogey at the ninth, Arozamena dropped her birdie from 25 feet at the 10th to get to 4-over for the tournament. With a 54 degree wedge in her hands at the par-4 12th, Arozamena holed her approach from 100 yards to quickly move into contention, going 4-under during a four-hole stretch. Knocking a 6-iron inside of two feet at the par-3 13th led to another tap-in birdie and Arozamena would finish the day at 6-under par after nearly carding an ace at the par-3 17th. Qualifying for her first USGA event after wrapping up her senior season at Iowa State University last week, Arozamena couldn’t put into words what qualifying for the biggest tournament in the U.S. equates to. Emma Albrecht, Ormond Beach, Fla., and Grace Kellar, Edina, Minn., finished as first and second alternates, respectively. The 2018 U.S. Women’s Open will be played May 31-June 3 at Shoal Creek in Shoal Creek, Ala.